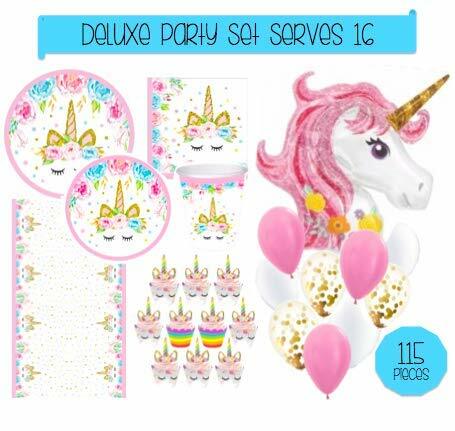 Trendy Unicorn party decorations and tableware set - Serves 16! This pink & blue floral design featuring a sweet sleepy unicorn adorned with a flower crown and long eyelashes will have the birthday girl and her guests talking about your party for weeks to come. Heavy weight paper products and decor to match. The 46" larger than life unicorn balloon will make the perfect centerpiece! Package includes everything you need for baby's first birthday, baby shower, bridal shower, sweet 16 and so much more... Whether you're 5, 8 or 72, you're bound to believe in magic. And when everything is disposable, you're left with no dirty dishes... so even moms will believe! 濾 Unicorn Party Pack is perfect for all unicorn lovers, 1st birthday parties, sweet 16 parties, baby showers, picnics, wedding celebrations, bridal showers, and so much more. This pink & blue party set is perfect for anyone who loves glitter and magic! Tableware for party of 16! 16ct Dinner Plates (9 inch) - 16ct Dessert plates (7 inch) - 16ct Paper Cups (9oz) - 16ct 2-ply Paper Napkins - 20 reversible rainbow cupcake wrappers - 20 cupcake toppers - 1 tablecloth - 3 Pink latex balloons - 3 White latex balloons - 3 Gold confetti balloons - & an extra large 46" Unicorn Foil Balloon! 濾 Deluxe fantasy party kit provides you with all of the Unicorn party goods you need to put together the perfect event in one quick and easy click! Send out the invitations and get ready to enjoy the PARTY! If you have any questions about this product by Love, Summer, contact us by completing and submitting the form below. If you are looking for a specif part number, please include it with your message.